Germaphobic – just a little? If so, you certainly aren’t alone… and if you’re not convinced about setting your kitchen up as a science lab, I totally get that too! 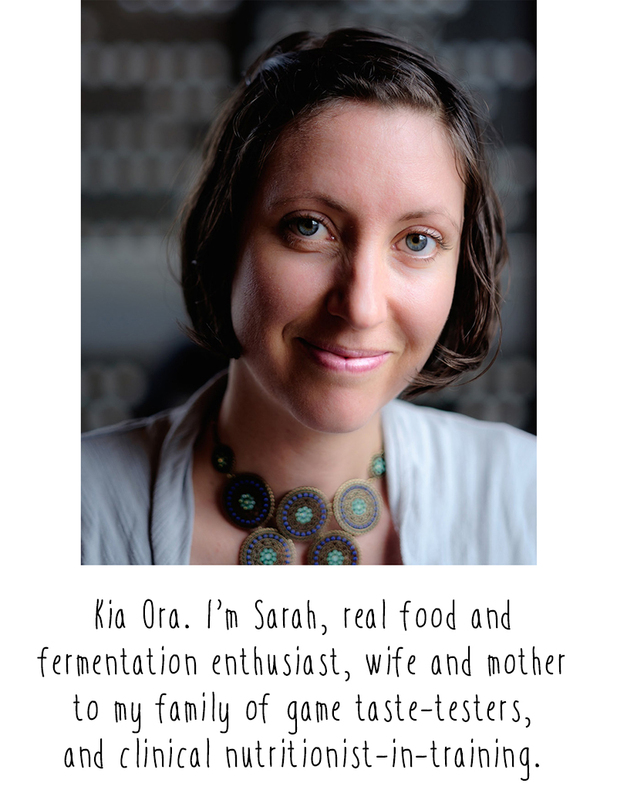 But would it help knowing that some of your favourite foods are fermented? If you were stuck on that desert island, would chocolate, wine or cheese make your must-have list? Perhaps you couldn’t go long without a cup of coffee? Or maybe you, like me, have discovered that a slice of sourdough bread is just better with cultured butter. You see, once upon a time, a very very long time ago (as early as 7000 BCE in fact), we humans learned to co-opt microorganisms to en-culture and preserve our foods. Truly distinctive cuisine emerged. Think Japanese miso, Greek feta, or German frankfurters with sauerkraut. Pick any place on the globe inhabited by humans, and odds are good you would have sniffed out a traditional fermented food not far away… or possibly from quite a way away, in the case of the kiwi delicacy, kanga pirau (literally ‘stinking corn’!). If you’re up on buzzwords like probiotics and microbiome, you’ll be aware that the science is building on how critical microbes are to our health. The bacteria that live symbiotically on and in each one of us vastly outnumber our human cells. The majority reside in the large intestine, forming one’s ‘gut flora’, and there they carry out a myriad of beneficial functions, including optimising digestion, assisting with detoxification, regulating immunity, and boosting mental health, not to mention creating an environment inhospitable to pathogenic bacteria, yeasts, and parasites. Unfortunately, modern living isn’t kind to our gut flora. Highly processed diets, antibiotics, and even stress (amongst other factors) can impact on the numbers and diversity of our microbial communities. That’s where cultured foods come in. Often containing both prebiotics (foods that nourish our gut flora) and probiotics (strains of bacteria, moulds and yeasts identified as being pro-health), they are the perfect parcels to show our gut bugs some love: think of it as sending in supplies and reinforcements to the good guys. Thanks to the work of those probiotics, cultured foods generally deliver high levels of bioavailable nutrients, plus enzymes and lactic acid to aid digestion. They have also been breaking down harder to digest substances such as lactose, phytic acid and gluten. And as an added plus, I’ve found that consuming cultured foods has significantly tempered my sweet tooth (I will stop myself here, but if you’re interested in keeping up with the latest research, interviews etc, do follow along on facebook). So really, there’s not much not to like about these foods, no? Ok, ok, some cultured foods do have an ‘acquired’ taste, but I’ll be sure to add tips and serving suggestions to my recipes to get you started. And if you’ve had an experiment go wrong, or have nagging concerns about the safety of DIY fermentation, check out the start here page or come along to a workshop, and I’ll do my best to allay your fears (cos yeah, I’ve been there too).